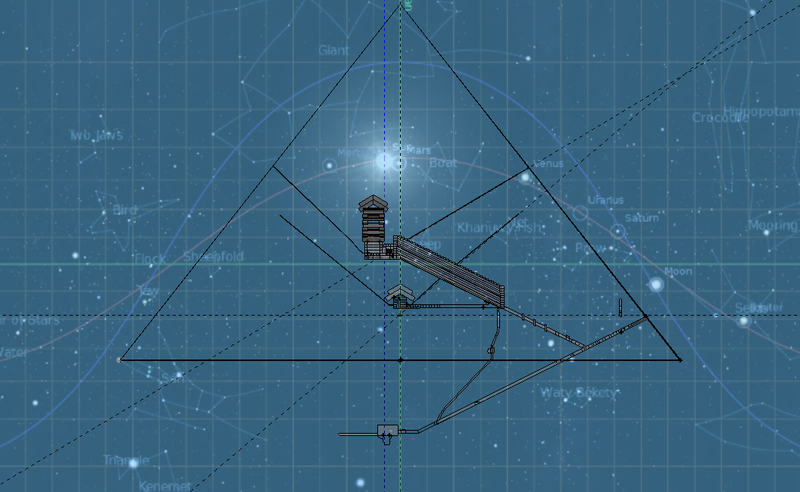 The analysis thus far has concentrated on having the horizon of the overlay interacting with the pyramid by way of the centre-point upon the intersection of the join between the 20/21st courses, and the east/west axis of the pyramid. There are certainly strong reasons for defining the base of the pyramid as being the horizon level, besides any other level within the pyramid when it comes to speculation, but any other level did not identify such strong associations for a main plan of the pyramid's architecture as did the one used. As mentioned very early on in the analysis, other levels would be given attention because there are further correlations between the pyramid and the astronomical maps being used, as well as particular confirmations between adjusted centre-points and certain courses of the pyramid. The first alternative concerns the base-level of the pyramid, which one would have expected as being the all important centre-point from which such an analysis as this would have defined as being the key to the plan of the pyramid coming from our celestial view. As we have found by locating the horizon of astronomical overlays upon the 20/21st courses and the east/west axis of the pyramid, a great deal of information has given a strong argument for the value of this analysis, and yet we are left with the question of the various thicknesses of the pyramid's courses, and to what they refer. That several of them – as well as the location of the subterranean passage – do agree with the astronomical latitude levels, and there is the possibility that courses may be associated with the levels of stars at particular moments in time although that is very hard to prove, having alternative horizon levels does show further correlations between the astronomy and the courses, as well as offering alignments between certain stars and the projections of passages, shafts, and floor levels. A good place to start is viewing the image of the winter solstice midday moment for 2,550 BCE, overlaid upon the east/west axis and upon the pavement level. 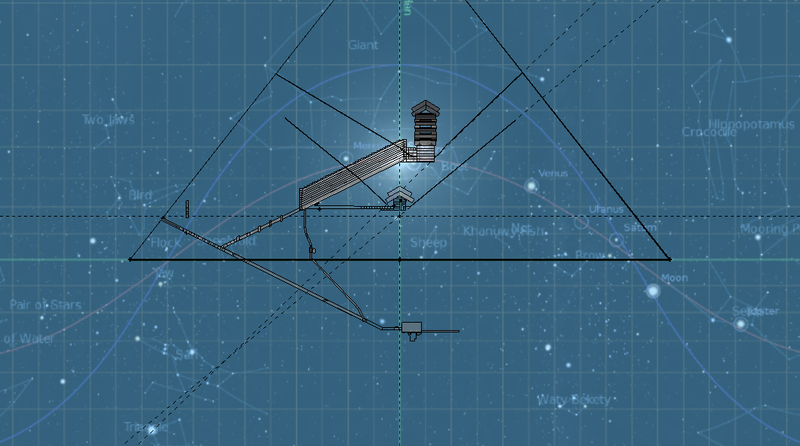 What can be seen from this is the triple intersection of horizon, ecliptic and equatorial line is nearly seven minutes premature from being observed, while the centre of the Sun rests some 9” above the edge of the Gallery's top step; Sirius is seen aligned with the projection of the upper south shaft. It is certainly an important adjustment to the vertical axis when the Sun is seen in its location a little above the edge of the top step, and it must be remembered that this arrangement of overlay upon the pyramid represents the actual position of the Sun, while there is a small range of measured positions when we consider the geometric view as opposed to the apparent view, as well as the angle of obliquity of the Earth: this can have an affect upon what is being measured to when we consider the exact position of the edge of the top step, in the same manner as the 20th and 21st courses may define the two views of geometric and apparent, so the obliquity might actually have the Sun upon the edge of the step. Having this arrangement between overlay and architecture is a very expressive interaction, and a very solid point towards not just Khufu's time period but also the winter solstice in general. To consider the exact moment when the TI is observed would see the Sun some 22.5” within the passage to the Antechamber, and this would see the TI exactly upon the base-level of the pyramid. Another point is that the Sun would be exactly upon the floor of the Antechamber when its arc places it beneath the wainscots, where three moveable barriers once existed. In its view at the moment with its slightly skewed angle, it is interesting that the TI intersections are approximately 58” below the pavement in the east, and the same above the pavement in the west; and while this measurement is lower than the lowest location of the sockets, it does agree with the height of the first course. It is not certain that the first course reflects this difference to perfect observation, considering the winter solstice Sun can differ in its height by some 20 – 30” because of axial precession, but it is possible that the sockets and their four different depths might indicate the TI while the Sun does rest at midday upon the top step. Taking this a step further, we can view the moment when the Sun sets and include several boundaries which also have an interaction between the astronomy and architecture. The boundaries are kept upon their main level beneath the Queen Chamber, upon the CP, and they offer several seemingly important observations, or they may just be coincidences, such has been the possibility with some of these images because they appear too exacting. The outer boundary is that of the NSIP – north shafts' intersection point – which can be seen to pass across Chertan of Leo, and Vega. The next boundary is that of the summer solstice, passing over Regulus. The third boundary is the socket's layer, somewhat coincidentally passing over Venus while also taking in Altair at the tip of the Giant. The inner two boundaries are the winter solstice and the niches at the top of the shafts of the Queen Chamber, and we know that the winter solstice boundary is the middle of the two extremes of where the Sun rises upon the horizon due to the Earth's axial tilt; this boundary just misses both Betelgeuse and the Flock/Pleiades. The niche's boundary just misses Aldebaran. As we know that the form of the equatorial line always holds its shape, the image shows the line passing through the entrance passage in a very particular location. While I have found references to there being two sets of vertical lines in the upper part of the passage, I have been unable to verify this, although Petrie's survey defines their probable locations as being approximately 414” and 474” down from the casing. As such, the equatorial line passes through the middle of this section, and we have already seen that there is an association with this section and the 474” vertical lines as being a reference to a 3,600” measurement from the CP. It is possible these vertical lines indicate these two observations, besides also observing the equinoctial dates when the Sun reaches this area exactly one hour after Sunrise when the horizon is upon the pavement-level, and defines this part of the passage in the same way as the intersection of entrance and ascending passages define one hour before Sunrise when the horizon is upon its main level. When the horizon is upon the pavement level, Sirius does not reach the base of the niche until approximately 7,200 BCE or thereabouts, reaching the top of the niche around 6,380 BCE. This difference in time spans is due to the turn around speed Sirius has at the time of its lowest position, and the slowing down to reach that and rise from that, where as the higher it is in the sky, the faster it appears to rise or fall until once it again it nears its zenith and it slows down. Showing the image of 6,380 BCE with Sirius in the top of the niche and the horizon on the pavement level sees several correlations of stars according to the pavement level and the floor of the Queen Chamber. For the moment several hours earlier when Sirius is upon the horizon, it is aligned with the upper girdle blocks in the ascending passage, while Betelgeuse will be on the CP level and Vega will be on the level that Sirius had in the top of the niche. At this moment though, Vega is upon the socket's level. We saw in the previous section an overlay for 6,750 BCE where several stars were arranged to appear within the main passages, and the locations of Sirius were found to arc through firstly the entrance passage, then the ascending passage, to arrive upon the meridian on the face of the top step and several inches above the floor of the Gallery. When the overlay of Sirius on the meridian is used when the horizon is on the pavement level, Sirius is now found to have its centre resting approximately 80” above the floor of the Queen Chamber, which places it slightly above the level of the shafts within the chamber. The selection of this date was more-so dependant upon the location of Sirius as it crossed the horizon, but it certainly has had some other associated observations, where even just several years difference would have Sirius upon the floor of the Gallery when it reaches the meridian, as well as being exactly upon the level of the shafts due to the adjusted horizon-level. Turning to the 12,275 BCE overlay upon the pavement level, and showing all the relevant alignment projections, we do see that several stars have some significance in their positions but the arrangement is minimal for interaction between overlay and architecture. 10º	= 11th course: 428.6" – 461.55"
20º	= 26th course: 885.05" – 916.05"
30º	= 40th course: 1,336.85” - 1,368.7"
40º	= 58th course: 1,875.45" – 1,902.55"
50º	= 81st course: 2,497.25” - 2,520.6"
60º/Equator = 109th course: 3,280.75" – 3,306.15"
70º	= 151st course: 4,309.6” - 4,334.25"
According to Petrie's graph of the courses, these do not necessarily identify courses that are very particular, with the 11th course between two thicker courses; 26th between two pairs of courses that are very much the same thickness for each pair; 40th is nothing special at all; and the rest of the courses are either side of particularly thicker courses according to those surrounding them. It can also be seen for the 20º latitude that this is also the course that the shafts emerge into the Queen Chamber. As the angles to the passages and shafts are known, and speculation has been made by other investigators into the pyramid as well as what has been identified within this analysis, the base of the pyramid upon the actual ground, and therefore the whole of the pyramid, may be considered as the real-time interaction between plan and particular stars as well as the Sun. In other words, at the very time the pyramid was constructed was the direct influence of the surroundings upon the form and function, rather than a representational interaction between the form and function with a time long ago. From the few images above, and the observations of star positions and the little interaction there are with features of the pyramid, the same kind of overlays may not necessarily be applicable for the pavement level. We have seen that there is a mathematical association between two sections of the pyramid, where the height from the top of the first course to the top of the 89th course = 2653.15, and the height from the top of the 97th course to the top of the 143rd course = 1190.5, giving an implied ratio of square-root 5 : 1. If the base of the pyramid is not to be exactly upon the pavement but at some level within the first course, then all overlays are to be adjusted upwards to a maximum of some 58”. This does adjust all the latitudes upwards by that same amount but still does not identify the resulting courses more-so as being special than the ones mentioned above. And there is the scale of the overlay, considering we have become used to the locations of the 90º and 270º/due East and due West/TI being where they are according to the horizon atop the 20th course, when these locations might be better suited occurring upon the actual edges of the pyramid upon the pavement level, which would enlarge the overlays to approximately 1.1632 their normal size. With the position of the winter solstice Sun at sunrise and an hour before this having already been dealt with, enlarging the overlay would then see the Sun passing through the intersection of entrance and ascending passages once again, some twenty-odd minutes after dawn. But certainly the actual pyramid in its location, having been constructed, would interact with the Sun and the stars according to its design, and be performing its functions in the capacity it was built for. While the shafts might be aligned according to a previous time, they are also specifically constructed – with their inclusions – for a real-time aspect. That copper was part of their construction can only mean they had a real-time function, rather than being solely representational of an earlier period; and that they might be aligned with particular stars of the day – whether or not the upper shafts were enclosed or were open to the sky – is still speculation because of the exact angles of them, and to which stars they referenced. In stating this, the only shaft that does have a static angle throughout the length of it is the south shaft of the Queen Chamber. Both north shafts do bend horizontally and vertically as they course about the Gallery, and they do so in a very wide way, giving the Gallery a lot of clearance. The upper shaft has five vertical and horizontal adjustments to it, while the lower shaft has two, and possibly three but this is not certain. 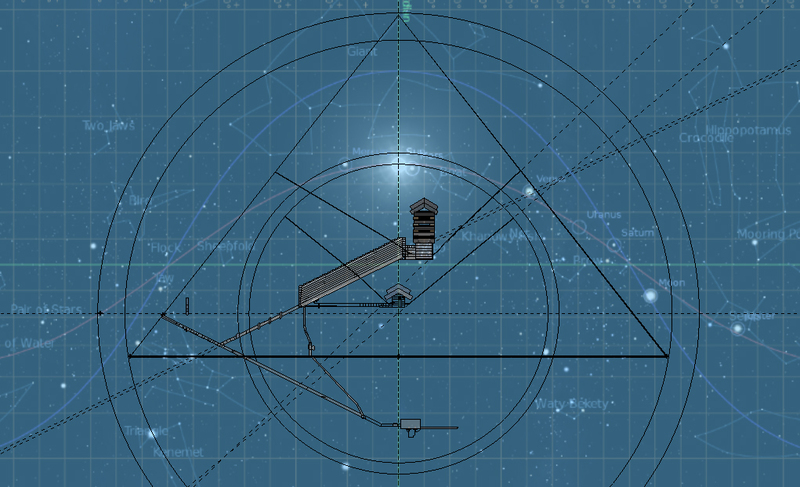 Accordingly, is this just part of the design to get the shafts around the Gallery, or do they represent particular directions in relation to the positions of certain stars being aimed at, or is it due to some function of the shafts and the copper within them? The upper south shaft has three angles to it, and as much as we know, there are no hindrances that call for this. Like the lower shaft, the upper should have been just one angle after leaving the chamber, and stayed with one angle until the shaft's ending. While it is possible that there is a passage or room beyond the south wall of the King Chamber, which would necessitate such immediate angles to the shaft after leaving the chamber, we will not know until such a thing has been investigated. being interactive with stars at the time the pyramid was constructed. 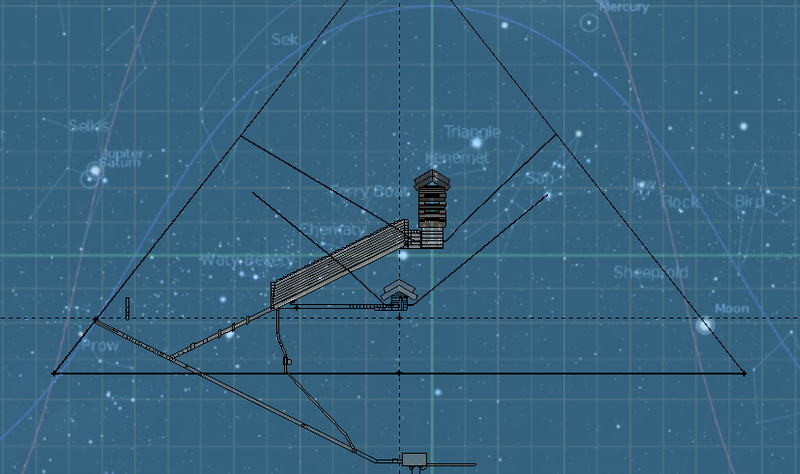 A further consideration then extends to scale of overlay which better suits a direct interaction between the astronomical view from the site of the pyramid, and the structure of the pyramid. There are just a few possibilities regarding this besides the one mentioned above: making the overlay agree with the height of the pyramid and the height of the Sun when it shines its light down upon the north face, which would see the scale as some 2.2 times the original, and turn the two dimensional view we are familiar with into a three dimensional view that blankets the pyramid as a sphere all around it; enlarging the original scale by 2.2 times, and defining four two-dimensional views to overlay upon the four sides of the pyramid; enlarging the original just two-times, which would see the TI now aligned with the complete size of the original, meaning our 360º view being 15,600” across now becomes 31,200” across, and still two-dimensional. 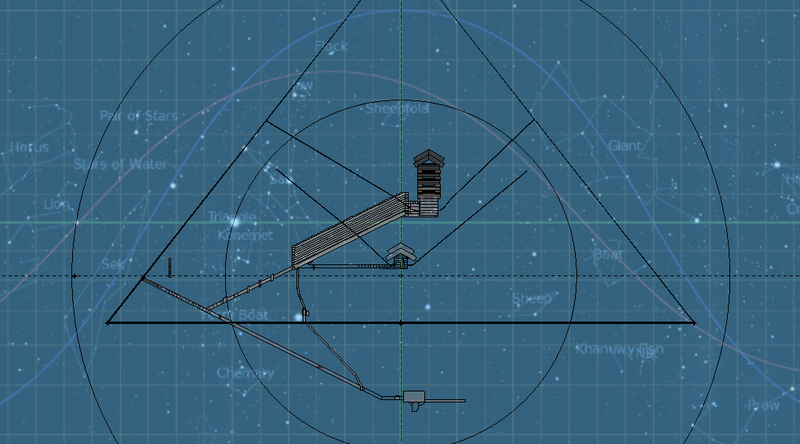 All of these adjustments would define particulars between pyramid and astronomy, but the certainty of them – besides the actual real view of sky at the site of the pyramid – could define all manner of possibilities that are coincidental, especially when differing courses are used to identify latitudes. According to the location and form of the pyramid, one particular interaction between it and its surroundings occurs on the equinoxes when the light from the rising Sun is said to shine down upon the western half of the pyramid's south side, and at sunset the light shines upon the eastern half of the south side. As the pyramid has concave sides, where the centres of each side are some 37” inside the straight lines of the sides, this means that on a very particular day each year – the equinoxes – this light effect is observable and can be appreciated as a significant attribute to the architecture of the pyramid having a definite interaction with its surroundings. Of course this light-play might also occur on the north side on two days per year, although having never been to the pyramids I cannot confirm which days, nor can I find any reference to this anywhere, but certainly it would occur. And we have the angle of the upper south shaft which has the Sun shining down it on two days per year, and for the observations of Petrie in his time, these days are cross-quarter days, being the midpoints between the equinoxes and the winter solstice. So it is evident that the actual structure of the pyramid has relevant interactions with the surroundings, so a pavement-level attribute is a real-time interaction rather than an inferred interaction, as has been found with the overlays through the thousands of years in history. There is one other alternate level to consider, and this one is the 46th course, which is of similar appearance as the 20/21st courses, ergo being thinner compared to those immediately surrounding. The middle of this course is selected, being 1,553.875” above the pavement level. Once again it is simple enough to adjust the horizon-levels of overlays and observe any correlations that gives credence to this speculation. We can start with the same winter solstice midday image of January 9th, 2,550 BCE, with the Sun upon the meridian, as seen below. In this image, four boundaries have been included to show the interaction between particular features, with these boundaries coming from our CP below the Queen Chamber. The outer boundary is the summer solstice in its most northern position upon the horizon, which we are familiar with; it passes firmly across Mirphak of the Bird/Perseus constellation. The next boundary is the socket boundary, which passes firmly across Sirius, and Algol from the Bird/Perseus. The third boundary is the winter solstice boundary, passing firmly across Canopus. And the fourth boundary is that of the Queen Chamber shaft's niches, which passes firmly across the Sun in its new winter solstice midday height. The date of January 9 is the first day of the winter solstice Sun position, and the Sun holds this position for three consecutive days which does affect how the stars are perceived in their background locations. On this date, it can be seen that the TI is not observed and it will take six minutes and fifty seconds of time before it is observed, which moves the Sun to the right 1º 56' 17”, or approximately 83.98” from the meridian. On January 10, the TI will be observed when the Sun is some 42” of a degree past the meridian, or approximately half way between the edge of the Gallery's top step and the south wall of the Gallery. While this does have an affect upon the locations of the stars, they are minimal. The main association with this adjusted horizon location pinpoints the Sun crossing the meridian upon the boundary of the niches at the ends of the lower shafts. 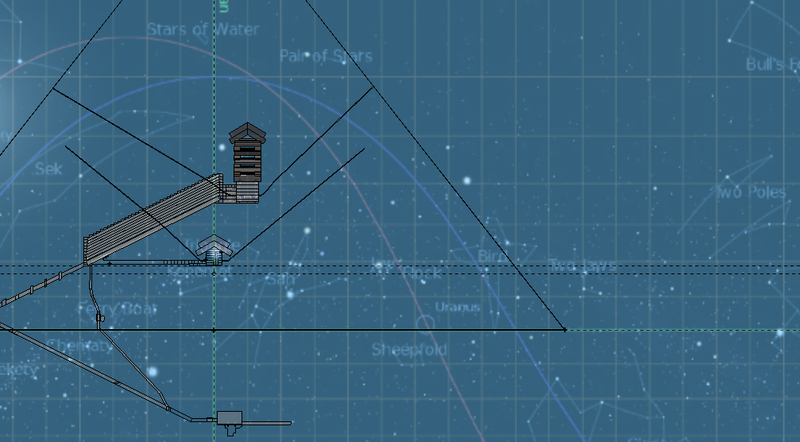 The stars for the most part will still appear on the boundaries depicted. There appears to be the potential of a further overlay that can have more interaction between several stars and the pyramid, especially concerning the proximity of Mars to the Sun, and also Vega and Betelgeuse. By taking this moment in time back several minutes, we see the next image, where the view of the pyramid is reversed. For aesthetics, it appears quite interactive: Betelgeuse is upon the very corner of the pyramid, and Rigel is within the alignment of the upper north shaft; Vega is within the alignment of the lower north shaft; Mars is just west of the meridian, aligned with the centre of the Queen Chamber niche; and the Sun is aligned within the passage between Antechamber and King Chamber, being approximately 30” inside and upon the first join of floor blocks there. As we have seen many correlations between the astronomy as overlays upon the pyramid, we know that all manner of correlations can be found, so it is not surprising that there are going to be arrangements and alignments as that above, but just staying with the selected dates that have already been used throughout the analysis, there will certainly be confirmations between this adjusted horizon level and the arrangements of stars and the Sun. In the previous section we had an overlay for 4,056 BCE when Sirius and Regulus rose upon the horizon at the same time. 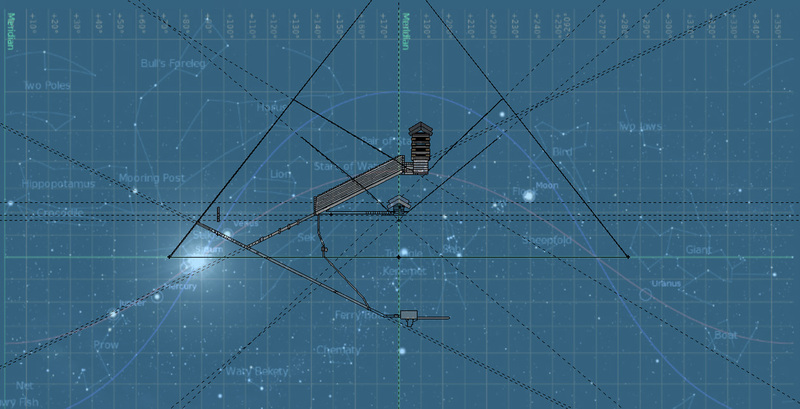 Including this as an overlay upon the higher horizon level offers the following image, which shows the solstice boundaries and the locations of particular stars. It must also be noted that Rigel rests upon the level of the centre point which defines a boundary that takes in the casing and the pavement level, which we saw previously as having a direct reference to pi. It is certainly worth showing the graph of courses with these indicated, and as can be seen, they are all very particular courses in themselves when compared to those immediately surrounding them. This means the 46th course is a good alternate level to use for its own observations, but why this is so has to do with the beliefs of those who planned the pyramid. To consider this a possibility with two horizon levels is an extra inclusion for this analysis, and certainly it is fraught with all kinds of arbitrary overlays that could be selected which might have nothing to do with the dates already mentioned as being important; then again there might be extra observations to be made that did not occur due to a lower horizon. Still using the same date in 4,056 BCE and the image of Canopus on the horizon, the overlay is aligned upon the 46th course and the meridian upon the axis of the King Chamber in the next the image. We had previously seen Betelgeuse at the end of the south shaft of the Queen Chamber when the horizon was on its CP level, now Rigel resides there, exactly in the niche. It can also be seen that the -20º latitude intersects with the arc of the equatorial line right at the entrance to the pyramid. To start from the beginning again, and incorporate a horizon and axial relocation of the overlays upon the pyramid does offer correlations between astronomy and architecture, so it is an intriguing arrangement in how this also agrees with the analysis and such a proposal. The date of 12,275 BCE, seen in the following image, shows projections of the shafts as well as the half-height of the pyramid and its boundary, and the new locations of many important stars can be seen to offer their own agreements with particulars of the architecture. One important correlation with this dual-axis relocation is seen in the position of Sirius. We know the widths of the Queen and King chambers, with the one being between 205.6” and 206.29”, and the other between 205.97” and 206.43” according to Petrie, and they are so similar that accounting for the slight injury to the King Chamber, it can be said that both chambers are supposed to be the same size. This is a major particular of the pyramid's architecture where Sirius can be seen to occupy the same longitude alignment on this same 12,275 BCE date, and where it was upon the south wall of the Queen Chamber, it is now upon the south wall of the King Chamber. Certainly the time period of 12,275 BCE to 11,862 BCE would see Sirius stretching across the entire width of both chambers, but with the overlay upon the higher horizon-axis, Sirius is now some 34.58” below the average floor level of the chamber. It is not that this is a valid association but certainly it is a very coincidental association. The size of the King Chamber is such that the length of it is twice the width, and when diagonal measurements are observed, it is known that the diagonal through the complete empty space of the chamber is equal to half the height of the chamber, so there are some exacting geometric rules applied to the chamber's size. But one thing that was not obvious with the horizon beneath the Queen Chamber was which star might have been interacting with the King Chamber: Sirius was in the Queen Chamber; Canopus was alluding to the Subterranean Chamber; it was very unclear what was defined by the location of the King Chamber. With this doubly altered axis adjustment, Sirius does impact upon the King Chamber, and may continue to do so through identifying certain dates which would have Sirius rising through the chamber and up through the relieving chambers, while also edging to the left and passing through the Ante-Chamber and subsequently alighting upon the edge of the Gallery's top step. We saw previously that Sirius reaches the top of the Queen Chamber niche in 9,711 BCE, and using that overlay now has Sirius approximately 148.5” above the King Chamber floor, which is the height of the Ante-Chamber. The potential for many corresponding observations can be made with subsequent overlays, and this can identify Sirius as having some impact upon the King Chamber besides other stars acquiring certain positions that further identify astronomical overlays influencing the pyramid's architecture, but this is not to say that the King Chamber is solely located according to the influence of Sirius. Its mathematical precision and the relieving chambers above it are very particular and unique when compared to all the pyramids ever constructed that have come down to us through time. We cannot answer for the things that we have no participation with, and where no instructions or other examples exist, certainly the possibility of meaning can be fathomed and imagined, even if there is more than one reason for something. Having realignments of the axis locations for astronomical overlays could follow on with already selected dates and also various other dates, and the overlays would identify correlations very similar to those identified but with the stars and the Sun holding new positions. Just to identify that there are two horizon levels within the pyramid besides its base level, and that these identify course-levels relating to latitude levels that are seen to be quite different in their thicknesses as compared to those surrounding them, does show some kind of duality to the astronomical overlays being interactive with the architecture of the pyramid. 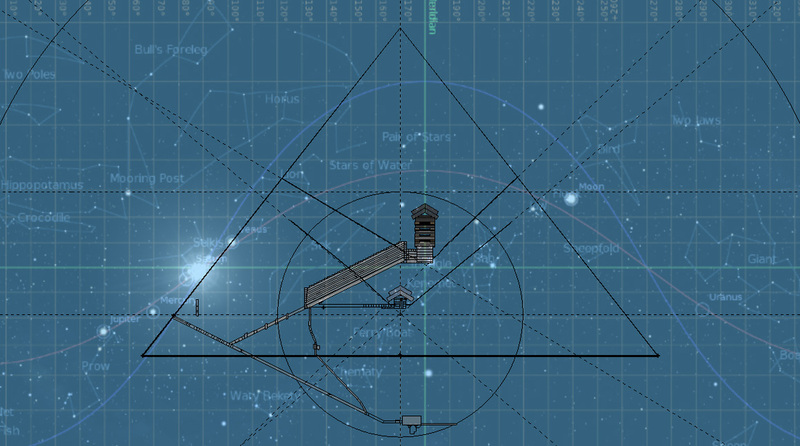 There is the base of the pyramid that one would think would have the most to say about such an interaction, but this must be according to the actual location of the pyramid and the view of the horizon and the movements of the Sun and stars as actually seen, rather than as an interactive plan, as has been inferred and subsequently identified throughout the analysis. In what has been presented, I have shown what can be found when a different approach to what the Great Pyramid can be modelled after is made, being that of a two dimensional structure superimposed by a flat map of the cosmos surrounding us from the location of Giza. Two certainties need be followed – those of scale and horizon location – for the numerous 'coincidences' to be found, especially considering two important dates in time: that of Sirius in its lowest position when crossing the southern meridian, which relates to the floor level of the Queen Chamber; and again with Sirius in its highest position when crossing the meridian, which relates to the half height of the pyramid. So many stars can also be found to reside in alignments to shafts, passages, and particular levels like those of floors. And then there is the Sun in particular locations, especially those of the equinoxes and solstices, and most certainly one hour before the winter solstice dawn which finds the Sun within the intersection of the two main passages of the pyramid. It is certainly a plausible analysis, and one that may define a further mystery.